Since its inception, Avatier has been providing smart security solutions for companies and organizations around the world. We enable enterprises to effectively manage employee access to all authorized networks, applications, and other resources. One of our most significant accomplishments to date is the innovation of voice authentication technology. The Avatier Triple Method includes a phone reset module, which goes way beyond our competition by offering more technology options and improved security. None of our competitors in the industry, among them the Microsoft Speech Solution Password Reset, can do what Avatier does when it comes to identifying employees and granting them access to corporate resources through voice biometrics. Employing two-factor authentication, the Avatier audio biometric password reset function is enabled by calling a special number, and announcing your employee number and PIN. Thus, with speech recognition matching up with your PIN, positive authentication is assured and the password reset process continues. In the event a token is deployed, such as an RSA SecurID, an additional factor of authentication can be introduced. 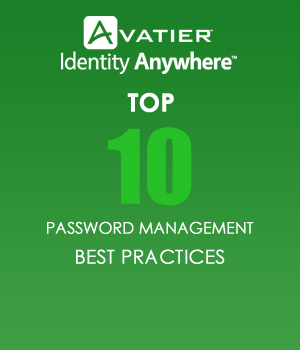 Additionally, unlike Microsoft Speech Solutions: Password Reset, Avatier identity management and password management automation will work cost-effectively across platforms to lower your administrative costs. Especially when you consider it is the most secure method of identifying an employee. Your worries about protecting corporate information can be put to rest. Contact an Avatier representative today to find out more about our voice authentication solutions and how easily they can be implemented into your company.